We offer an extraordinary selection of healthy bedding which includes dust mite covers, pillows, comforters, mattress pads and mattresses. We offer superior quality products that are comfortable and hypoallergenic, because there is nothing as critical as the quality of your sleep with no compromise. We have examined and tested all our bedding very carefully. Do I need Healthy Bedding? You need healthy bedding if you are trying to improve the quality of your sleep or you suffer from dust mite allergies. You may also require healthy bedding if you suffer from chemical sensitivities and have to sleep on organic materials. Many people buy our bedding simply because of the superb comfort that it offers, and the superior manufacturing quality of our goods. How does Healthy Bedding Work? Healthy bedding works by either protecting or being naturally resistant to allergens such as dust mites, being chemical free or manufactured in such a way as to promote a better night’s sleep. First of all, decide whether you need certified organic materials, or the extra peace of mind when goods are tested by Oeki-Tex, which certifies when goods have been manufactured free from a long list of harmful substances. Secondly, if you have dust mite allergies, cover your pillow with a dust mite pillow cover and your mattress with an encasing. Choose encasement materials which are sufficiently tightly woven to inhibit anything larger than 5 microns from penetrating it (this makes it dust mite resistant). We prefer the softness and flexibility of pure cotton. Thirdly, choose a pillow which is comfortable and congruent with your sleeping patterns. This will be determined by the pillow’s shape and degree of softness/ firmness.The pillow itself should be made of durable fibers which are naturally inhospitable to dust mites. 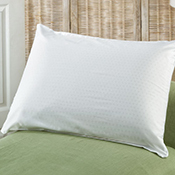 The pillow needs to be hypoallergenic,that is to say free from chemicals during its manufacture. Fourthly, if you are tossing and turning in the night and waking with an aching back, the chances are that your mattress needs replacing. This is where your investment will really pay off. A good quality mattress, besides lasting 20 years, will make an astonishing difference to the quality of your sleep. We have a firm belief in the superiority of natural latex mattresses which are in and of themselves, naturally resistant to dust mites and unlikely to need a dust mite cover. Fifth, select a comforter. Many people think a hypoallergenic down comforter (which means it has been washed multiple times to get rid of debris) is the best way to go. We beg to differ, although we do offer some superior down products. Wool or silk filled comforters are lightweight but still warm. They are a very healthy choice because they naturally wick away moisture, so you are less likely to wake up sweating in the night. The quality of the manufacture is critical to the durability of a comforter. 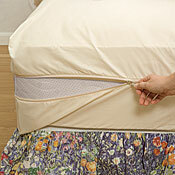 A box baffle design will stop the fill from shifting around which can create ‘thin patches’ in your comforter or lumps. Lastly, if you aren’t ready to purchase a new mattress and your mattress is too hard, you can soften it up considerably with the additional comfort of a mattress pad. These can range from wool-fill all the way to deep latex mattress pads. How to Use Healthy Bedding. Follow the manufacturer’s care instructions carefully for maximum longevity. Dust mite encasings can be washed in hot water or steam cleaned gently with a hand steam cleaner. Remember to rotate your mattress. We are not fans of washing either pillows or comforters. The washing process even with the largest of front loading machines will put wear on the item. It is better to use protective covers and avoid washing at all. Just be sure to air out your bedding periodically. In all bedrooms of the house, clearly starting with anyone who has a health problem or trouble sleeping. Dust mite covers: we prefer the breathability of 100% pure cotton coupled with being sufficiently tightly woven so that anything larger than 5 microns will not penetrate the fabric. 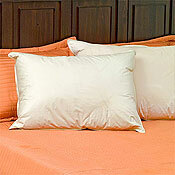 Pillows: we prefer latex pillows or fiber fill ( synthetic down) pillows. Choose the right level of firmness. 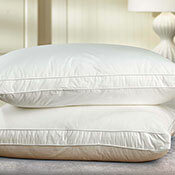 If your heart is set on a down pillow, choose one where the manufacturer warranties it will not trigger your allergies. Mattresses: choose a latex mattress with a detachable pillow top. 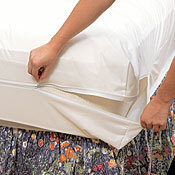 That way the pillow top portion can be replaced far sooner than the mattress itself. Comforters: choose a comforter which has sufficient warmth but is not overpowering. Make sure your comforter and duvet cover are sized to fit each other. Mattress Pads: make sure the mattress pad is actually large enough for your bed. Some of them are chronically undersized.